With the caffeine highs now subsiding after a very successful inaugural year, a freshly brewed Harris + Hoole Cup begins on 01 March. 2019 sees a World Cup-style format for the tournament, a blend of group stage [6 x 9 pts.] and knockout phase [17 pts.] spread over the year, winners filtering down to a finals day in London on 30 November. 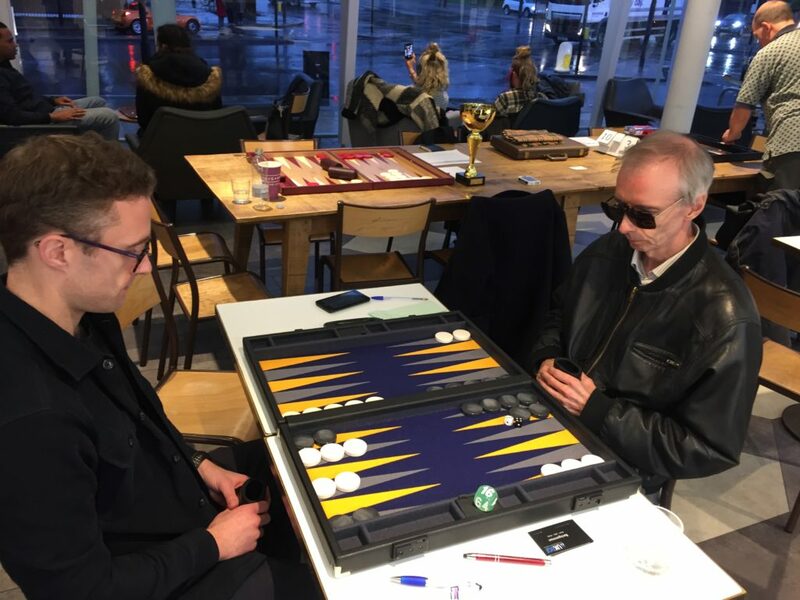 Finals day 2018, H+H Kensington branch, Simon Moorcroft [left] against eventual winner Alex Polden. Chris Purchase looking on. 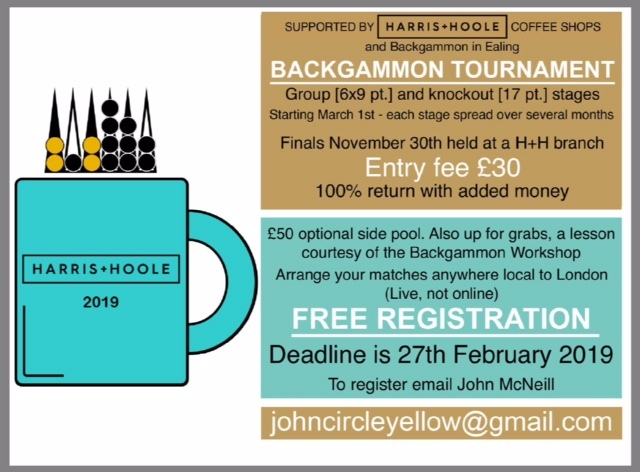 The H+H Cup is a competitive backgammon tournament, BUT, overseen by Backgammon in Ealing (BGiE) it has been set up to encourage newcomers, promote backgammon locally and reward good sportsmanship. As a company H+H are community minded, and supporters of local initiatives. We are very pleased to have them as our sponsor. Matches are arranged between you and your opponent, wherever you wish across London; a pub, a club, a park, even a coffee shop! To encourage the latter you can pick up an H+H 10 % discount card from any of the tournament committee. This year entry is £30. 100% returned as prizes, 80/20 winner/runner-up, with added money generously provided by BGiE. Additionally there is an optional £50 side pool. If you are unfamiliar with side pools the grande and the short of it is the sum of this pool is won by the contributing players who advance furthest in the competition, in this case split 70/30 between the top 2. 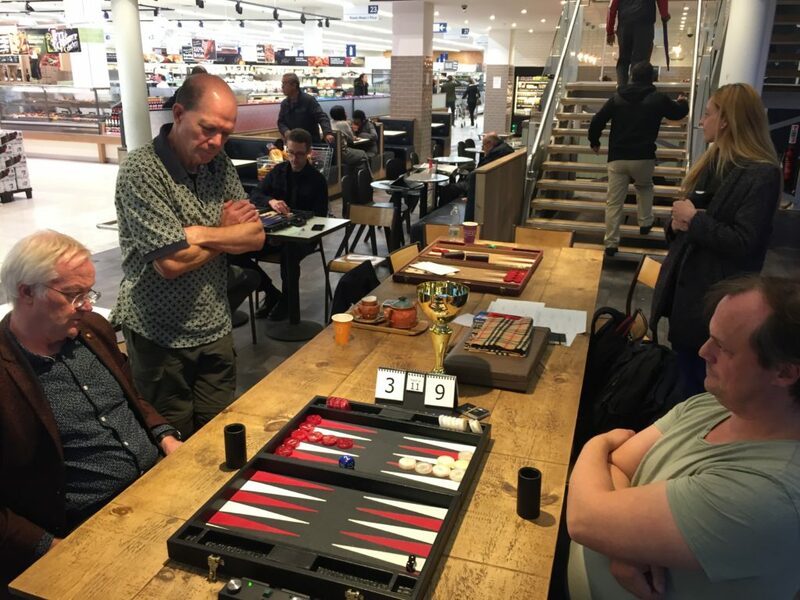 New this year, as a possible antidote to the bitter taste of finishing last in your group, and courtesy of Sebastian Wilkinson at Backgammon Workshop, we are thrilled to be able to award a Skype lesson with Sebastian to the best performing last place finisher from the group stage. Furthermore, there will be a special award (e.g. a hamper) to the player who most encompasses the camaraderie that we want to encourage; offering advice, insight, and any other sugar cubes of wisdom to less experienced players. This year promises a really great tournament, with plenty of room for adventure, victory, disaster… and coffee! We are limiting the tournament to 64 players so please register espresso. Registration is open now! For further details on how to register, the rules, the format, and the prizes, email John McNeill [johncircleyellow@gmail.com]. Feel free to share our flyer!